The advantages of rooting an Android phone are that you can use a number of apps that require rooting, you can also over clock your device after rooting it, or even replace the OS completely. It is just like jail-breaking an iPhone. I was able to root my HTC Explorer with minimal effort. Just follow these steps to root you HTC Explorer Android smartphone. 1. Download and install HTC Sync on your PC. 2. Unlock the boot loader of your smartphone from HTC. If your device is not listed in the drop down Menu select “All other supported models” from the drop down Menu and follow the steps. You will be asked to login or make one. The cracked file will be emailed to you. 3. Add a recovery patch by downloading it first and copying it in a folder C:\HTC. For this you will have to run the recovery.bat file on your PC with the phone in fast boot mode. To do that remove the battery of your phone, place it again in the phone and press the volume down and power buttons at once. This has to be done with the phone connected to the PC via USB cable. You should select first option in the Android Menu. 4. Finally, download the Superuser.zip file, and copy it in the microSD card of your HTC Explorer. Again go in to the recovery mode by pressing Volume down and Power buttons simultaneously. Install the file Superuser.zip with the option install zip file from the so many files on your SD card. You will have to find the file and select it. After sometime your device will be rooted. 5. After that boot your phone normally and download and install Root Check Basic from Google Play. 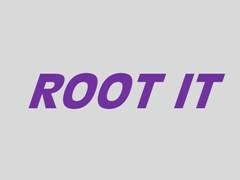 Run it to see if your device is rooted, you will get a message saying that it is. 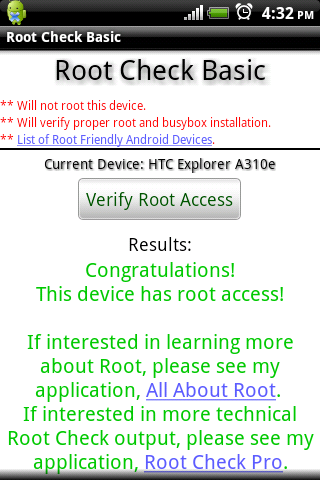 Now enjoy using your rooted HTC Explorer smartphone. See the screenshot below.